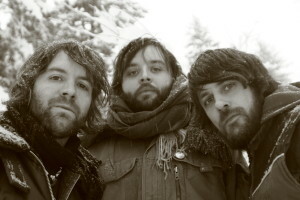 In the winter of 2008, Time Easton (Nashville, TN), Leeroy Stagger (Lethbridge, AB), and Evan Phillips (Anchorage, AK) set up a recording studio in an Alaskan cabin. The three contemporary troubadours wanted to capture a sound that contained the smoke of the bonfire and the steady, honest manifesto of the front porch stomp. The result was a full length album, One For The Ditch, and the beginning of a new band, Easton Stagger Phillips. ESP released One For The Ditch in the fall of 2008, touring Alaska as well as Ireland and Europe. After the tour, the members went their separate ways, each of them focusing on their respective solo and band careers. Four years passed, and even with their personal and professional lives getting busier by the year, the band decided it was time to make their sophomore LP. Ideas and demos were exchanged, and a recording date was set. The new batch of songs would be a departure from One For The Ditch‘s low key feel, and the band made a commitment to push themselves, and each other, into new artistic territory. Resolution Road, which comes out on vinyl, cd, and digital formats on May 20th, is a genre-blending suitcase of 10 classic-sounding folk and rock songs. ESP’s evolution from their first to second album is notable as Resolution Road features layered vocal harmonies, drums, electric bass, piano, organ, and electric guitars. The outcome is a very nuanced and tastefully produced set of tunes that takes listeners on a sonic road trip. From the massive opening harmonies of Phillips’ ‘Always Came Back To You,’ through the road-worn vocal delivery of Stagger’s ‘Life of Crime,’ to Easton’s poignant album closer ‘Baby Come Home,’ Resolution Road is the unexpected journey you take when combining the styles of three veteran songwriters. ESP will reconvene for a summer tour that will culminate at Alaska’s ‘Salmonstock Music Festival‘ in August 2014.